President Kimball taught that we only have a limited priesthood authority here on the earth. There are some ordinances that can only be done after this life. Such as Resurrection and begetting spirit children. Brother Cleon asks, Why Jesus had to suffer? Why couldn’t Heavenly Father just let us back in his presence after we repented? He is God after all and has all power. Here we learn there are two things in the universe. Those things that act and those things that are acted upon. In Abraham 3:19 we learn that all intelligences are not the same. They have different levels of intelligence. The lowest intelligences were to become the dust. Higher intelligence were to become plants. Even higher were to become animals. Still higher were to become the Spirit children of Heavenly Father. We also learn in D&C 93:33 that there are elements in the universe. Without intelligence these elements could do nothing. Only be attaching an intelligence to an element can the elements move and react in our universe. This is how elements can obey God’s word. If you command a mountain to move by faith then all those little intelligences obey and move their respective elements and as a whole the mountain moves. because those lower intelligences were not able to progress further to become Spirit Children, because of the Laws, they demand that God follow the same laws with us. Because we have fallen we must be judged the same and cannot progress. If God broke this law he would loose the trust of the intelligences. The intelligences would give up following Him and would go out and do whatever they wanted. The universe would fall apart. So in order to get back to Heavenly father there must be some way of getting around the intelligences’ sense of justice. So is it to be done? First the Spirit that is the best and most loved of all, Jehovah is needed. Then He is sent to earth and lives a sinless life as Jesus Christ. Then He has to suffer. Now because He is sinless He can return to the Father without the intelligences getting upset. But also because He suffered the intelligences have compassion on Him because He was sinless yet suffered for all sins. So when Christ pleads on our behalf, if we did the best we could, the intelligences will say, “Well, that person sinned they shouldn’t be able to go back, but since you suffered for them and you were sinless they can come back if you want.” This creates a sort of loophole in the Justice of the Intelligences. This loophole is called Mercy. And these closing words from Brother Cleon, “You know as you begin to understand this beautiful doctrine–the intelligences in the universe, the fact that their honor of God is what makes Him God–the fact that if He lost their confidence, He’d cease to be God–these are basic doctrines of the restored gospel as it says in Jacob 2. Why don’t we talk about the atonement more? We don’t talk about the real basis of the atonement–we talk about it as a proven fact, without ever reaching out and saying, “Heavenly Father, I think I understand just a little. I think I understand.” I don’t know what it does for you but it has made me to love my Heavenly Father like I’ve never loved Him before. And I’ve learned to love the Savior Jesus Christ like I’ve never loved Him before. Now that I know what those two wonderful people did for me and you and our children and all the people of this world, the planet on which we live–and all the beautiful things that He’s blessed us with. It would have all been destroyed and lost if those two people hadn’t done what they did. I love them for that. This is a diagram for a book I’m working on. It is a book that talks about astronomy but includes teachings of Joseph Smith. 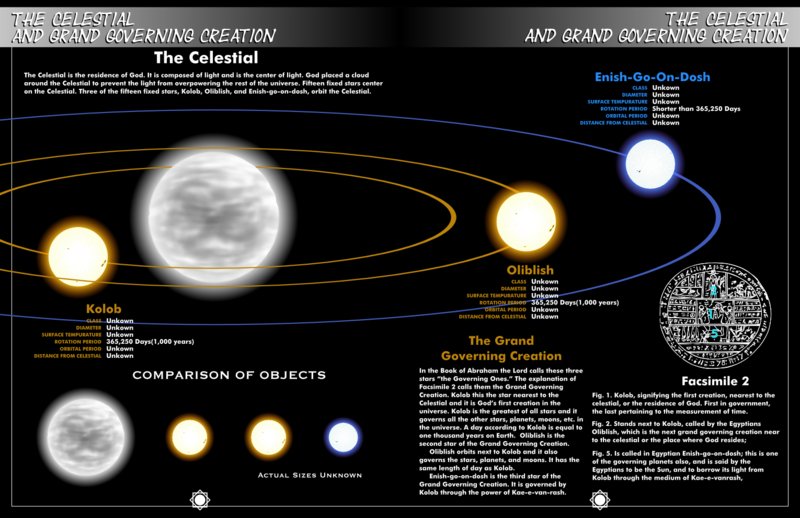 These two pages explain the Celestial and the Grand Governing Creation as described in the Book of Abraham and the Kirtland Egyptian Papers.